Mind hacking, drugs, punk rock and body disposal. 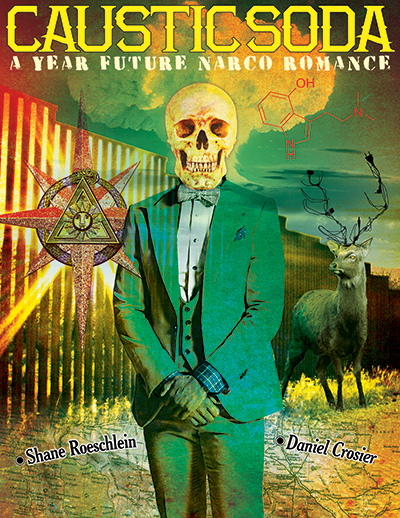 Caustic Soda – A Year Future Narco Romance is a comic book series written by Shane Roeschlein and illustrated by Daniel Crosier. Caustic Soda is an action-driven graphic novel set in San Diego, CA in a speculative future where a war for control of the border has erupted between the unified narcotics syndicates of Mexico and the Paramilitary Security Corporation, Agility. The narrative follows the work of the Arnelle Liquidation Associates, a group of freelance assassins whose base of operations is a punk rock club called The InterZone, where they dispose of their victims. The dangerous work performed by the kill-for-hire team affects both sides of the conflict, blurring the lines of loyalty, friendship and love. Protagonist Anton Nevona is an analyst for Agility Inc. and a liaison to the Arnelle Liquidation Associates, brokering targeted kills for the highest bidder. He also has a unique skill, using his Ouroboros ocular implant he can hack into a persons brain, reveal information and gain access to memories. Despite a simmering addiction to an entheogenic stimulant called bLoom (which filters his perceptions and effects his actions), Nevona finds himself implicated in a terrorist attack and accidentally amputates his thumb in the middle of a Department of Homeland Security raid, all before breakfast. Daniel Crosier illustrates the comic by hand, using ink and graphite on birch wood panels. Summer 2013 saw the successful launch of a kickstartr campaign to fund the production of the novel. Currently in production, the first 3 collected issues will be available in Summer 2015.